Johnstone Strait from Robson Bight. 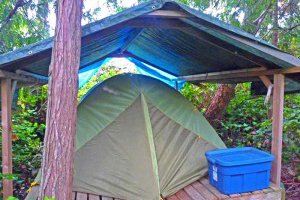 Our secluded base camps are located some 17 km (14 miles) from Telegraph Cove. A great variety of wildlife is close by our camps during the June, July, August and September. Camp locations give the guests on our outdoor adventures multiple opportunities to see and encounter a variety of wildlife that is hard to match anywhere else on the West Coast. Both camps allow guests access to sheltered and open water sea kayaking. Our camps and the way we operate our trips makes us unique. Our experience has made us the company we are today. 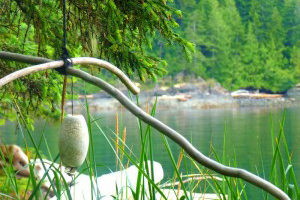 This camp is situated on a small island across from Robson Bight in Johnstone Strait. Our island camp provides dynamic scenery, with great views of Robson Bight, the snowcapped mountains that tower over Johnstone Strait. Our location takes advantage of spontaneous visits from pods of Orca, Humpback and Sea Lions. The camp is situated within the Qwiquallaaq/Boat Bay Conservatory, which protects a sensitive marine and rainforest ecosystem. 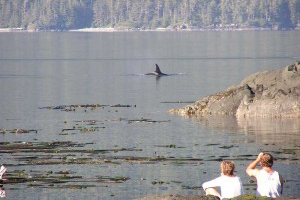 Our second camp is situated on a quiet cove across from OrcaLab in Blackfish Sound. 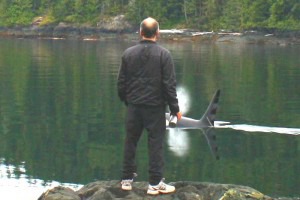 It is used for our Orca Explorer travel packages guests. In this area, Orca cross the Sound, and Humpback reside 24/7 all summer. 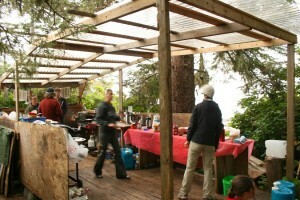 The camp has a beach, wilderness trails, and a distant view of the mountain range on Vancouver Island. It offers a variety of kayaking in sheltered waters among clusters of small islands and islets rich in native culture and marine life. Each of our camps has a network of well-established, low-impact cedar chip trails, connecting to tent platforms nestled among the trees. Following trails further into the rainforest. one will find our Zero-Impact composting toilets, places to shower, and a common eating area close to a kitchen with a view. All tent sites are within hearing (or seeing) distance of Orca Whale blows, eagles, ravens, and sea lions. Several of our private platform tent sites are located near the water’s edge, providing prime views of the ever-changing waters and abundant marine life from within the comfort of your tent. Quality three-person dome tents with full rainfly keep you warm and dry. All our tents are secured on level tent platforms above the ground. 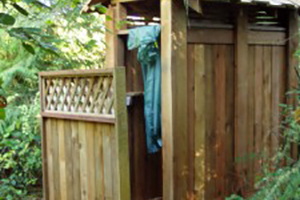 A tarp overhead and surrounding trees, salal and other shrubs provide extra privacy and protection from the elements. Inside each tent, floors are lined with cushioned interlocking floor mats to provide extra comfort and insulation. We will have a number of small beds with a thermarest mattresses in larger tents at each camp along with our usual dome tents with sleeping mats. We realize that not everyone on our kayak vacations can sleep on mats on the floor and still enjoy multiple days of paddling. You can bring your own sleeping bag and foamy, or you can rent one with a liner for $25 to ensure a comfortable night’s sleep. Our comfortable, spotlessly-clean cedar outbuildings have zero-impact composting toilets and are within easy reach of each tent via our network of trails. Each toilet is situated down a side trail for maximum privacy. Whether warmed by the sun or heated on the stove in the camp kitchen, a warm shower is a welcome luxury in this remote setting. 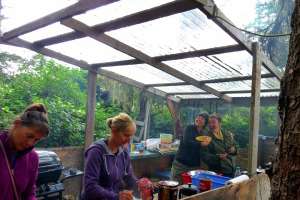 We create wholesome, freshly-prepared, food for our guests. Are you not willing to give up all your Tech Toys? There is a good G3 signal in the area. We can recharge your digital gear on the boat, or you can use the solar panels at each camp location. Sport Fishing from your kayak near camp can be great fun. Bring your own fishing gear (get lures locally), and see if you can catch a salmon or rock cod. We will cook your catch fresh for dinner. A saltwater fishing license is required. For weather, expect mornings that are still, warm, and misty. The weather progresses into clear sunny afternoons with light breezes, making any time of day perfect for paddling. We constantly monitor weather, and when it is going to change, we know in advance. In the event the weather at the start or during your trip turns to the dark side, you will see why we have such elaborate basecamps. Our locations and our boat provide us with the strong options for paddling in protected waters nearby when other companies’ groups must ‘hunker down’ and wait the weather out. Timing is everything with whales. We’ve spent a great deal of time perfecting our skills to ensure that you are not just seeing whales but getting the best opportunities of the day to observe the natural behaviour of each pod that passes by or plays on the surface of the water. 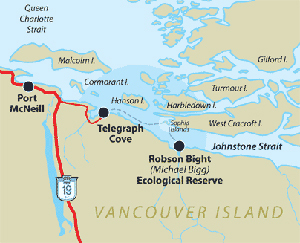 From our the JS basecamp, it is an moderate, 3-km paddle across Johnstone Strait to the Robson Bight Ecological Reserve and its world-famous Killer Whale Rubbing Beaches. Visiting summer researchers’ is always on the schedule Eagle Eye Lookout via a short paddle and a 3km hike. Orcas, Humpback Whales, Mincke Whales, Porpoises, Dolphins, Seals, and Sea Lions all frequent the waterways surrounding our base camp. At night, you can hear the whales blowing as they pass by within a few meters of the island. Not every person in your group wants to paddle every day? There is so much to see and do here, that all our guests always have a remarkable summer sea kayaking and camping experience. While most of our guests prefer to paddle every day, you do not need to be an experienced paddler to explore the waters with us. Our camp is so well situated that you can view Orcas, eagles, seals, and even cruise ships close-up while remaining on the island. Our established trail network allows you to walk the whole Island in less than 30 minutes. Want to see a beautiful sunrise? Go to the East side of the Island. If you are waiting for a gorgeous sunset, walk over to the west side. And if you prefer to paddle very little or not at all, simply enjoy the seclusion, privacy, and marine life while relaxing on shore. On dark evenings after warm afternoons, you may see the bioluminescent microorganisms glowing in the water. In the sky, enjoy the view of the Milky Way and the northern lights, without city lights to interfere. Spirit Gift left by a past Adventurer. As fascinating as it is to see the whales up close, you won’t want to miss listening to their conversations via radio, tuned in to our network of underwater hydrophones. When you can’t see them out there, or even hear their blows, it is quite a thrill to realize that, while all seems quiet, underwater there are numerous, very fascinating whale ‘conversations’ going on as they go about their day or night activities.